Water therapies – commonly referred to as hydrotherapy, are a range of therapeutic body treatments that i nvolve water.Some therapies involve moving and exercising in the water, and when you visit a spa, you might find that hydrotherapy pools. 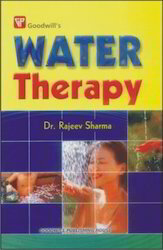 We provide a wide range of water therapy to our customer. At Maher you can experience the wonderful calming and therapeutic qualities of water. Water therapy or Hydrotherapy is the use of water to cure and alleviate a variety of ailments. It is the most favorable system of restoring normal functions in the body. It is employed to help balance metabolism. A cleansing technique where in lukewarm isotonic saltwater is poured into one nostril, so that it leaves through the other. The procedure is then repeated on the other side, and the nose is dried by bending forward and by rapid breathing. Proven to be very effective in certain respiratory disorders. The ancient Indian sanskrit term Samadhi best describes this experience; Samadhi is the bliss in which one disappears, it is immensely beneficial to disappear, to take a break from the worrying mind, but don't worry you will come back! It is employed in different forms in treatment and produces several types of physiological effects depending upon temperature and duration. Hydrotherapy is employed in almost all types of disease conditions. The experts at I Care believe that learning is fun and they accomplish this with lots of fun activities for kids including Play Therapy, Art Therapy, Music Therapy, Dance Therapy, Water Therapy . Drink 5/6 glasses (1.5 Litres) of water every morning and avoid medicines, injections, doctor fees etc. You will never believe this before you actually begin practicing!